FAMILY OF SECRETS reads like a spy thriller. At the center stands George W.’s father, George H.W. “Poppy” Bush, whose public persona has always been that of a bland, patrician “genial bumbler.” In chapter after chapter, Baker unveils another “Poppy,” this one a ruthless master of elaborate covert operations and perception-management campaigns. Although the Bushes went to great lengths to create the notion of a substantial divide between father and son, the truth is that W. was essentially a bumptious and indiscreet version of his father. I’ve just received a review copy and can tell you all, even having just begun to dig in to this massive volume, this is a serious piece of journalism! Not just a deep investigation into the Bush’s themselves, but a peak into present and historical power structures of the nation (and thus the world). * George H.W. “Poppy” Bush’s role in covert operations that profoundly affected America’s history long before he became CIA Director or President. * Personal secrets that George W. Bush and his handlers worked for decades to suppress. * The untold story behind George W. Bush’s religious “awakening.” * Why Bush Sr. cannot recall where he was the day John F. Kennedy was assassinated. * The little-known Russian émigré who was linked to Bush Sr., the CIA, Lee Harvey Oswald, and the Kennedy assassination and who met an untimely demise. * The most authoritative case ever presented that George W. Bush walked away from his US military obligations, an act with potentially serious legal consequences and no statute of limitations. * How the CIA monitors the White House and its occupants. * The story of the Bush family operative who graduated from babysitting an adult W. to fronting for a vast Saudi money pipeline into Texas. * The hidden connections between the investment funds of America’s most prestigious universities and covert intelligence operations connected to Bush family businesses. Baker systematically follows previously invisible threads that reveal Watergate to be a bloodless coup in three parts: creating the crime, implicating Nixon, and then ensuring that an aggressive effort would be mounted to use the ‘facts’ of the case to force him from office. Baker provides gripping new information about how Poppy Bush, Bob Woodward and White House counsel John Dean were connected to this still-mysterious American epic. Baker’s research led him into even deeper waters. While reporting on Bush Sr.’s activities in the early 60’s, Baker discovered curious inconsistencies in Poppy’s account of his activities on the day John F. Kennedy was shot. “At 1:45 pm on November 22,” Baker reports, Bush Sr. “called the FBI to identify James Parrott as a possible suspect in the president’s murder, and to mention that he, George H.W. Bush, happened to be in Tyler, Texas.” As Poppy was making the call, Baker writes, Poppy’s own assistant was visiting Mr. Parrott at home. Baker goes on to describe what appears to be a virtuoso performance on Bush Sr.’s part at the time, creating a misleading paper trail regarding his own whereabouts that day while protecting his business interests and political future. But Bush Sr.’s biggest operation was engineering his son’s rise to the presidency. Baker’s reporting presents Bush Jr. as an unruly scion who nevertheless relied heavily on his father’s extensive contacts and CIA expertise to erase all records of his misdoings and build a resume befitting a future president. Digging deep into Bush Jr.’s still-murky National Guard service record, Baker provides the most thorough account yet of what really happened. He also documents how W’s long track record as a womanizer and party animal was sanitized via a carefully calculated born-again Christian conversion that few dared question. Baker interviews the man who wrote the memos to the Bush family on how to gain the vast evangelical vote that put him in the White House. 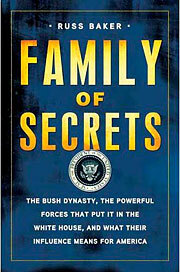 Combining gripping stories, explosive revelations and trenchant analysis, Family of Secrets is nothing less than a secret history of the elites that have shaped American politics over the last century. Russ Baker is an award-winning investigative reporter with a track record for making sense of complex and little understood matters. He has written for the New Yorker, Vanity Fair , the Nation , the New York Times , the Washington Post , the Village Voice and Esquire . He has also served as a contributing editor to the Columbia Journalism Review . Baker received a 2005 Deadline Club award for his exclusive reporting on George W. Bush’s military record. He is the founder of WhoWhatWhy/the Real News Project, a nonpartisan, nonprofit investigative news organization, operating at whowhatwhy.com .